Design is not just for designers. Everyone uses design at some point—whether it’s making a presentation for a conference talk, printing “Lost dog” posters, or creating social media graphics to promote your business. Great design improves the understanding and retention of information, as well as the customer’s perception of your brand. 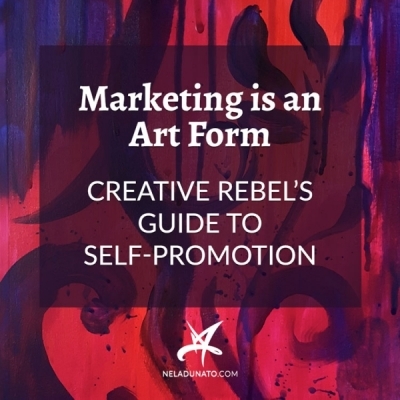 Failing to improve the design of your visual communications has real impact on the message you’re trying to communicate, as well as your profits. UPDATE: I created a handy visual checklist containing all the points I mention in this article. You can download it at the bottom of this post, or click here to jump straight to it. My business owner friends often send me their DIY designs to critique them. I also teach a graphic design course and get to see how my students’ work evolves over time. Design is not “just a job” for me, so I pay close attention to everything I encounter on a daily basis: price lists, billboards, flyers, business cards, social media posts, etc. Taking only a few minutes to fix these newbie design mistakes will pay off, not to mention reduce the chances of designers facepalming when they see your work. We use visual hierarchy to draw attention to the most important information, and guide the reader to find out more by varying text size, style and color. they emphasize information that is not the most important. The left example is pretty clear: all the information looks the same, and nothing stands out. 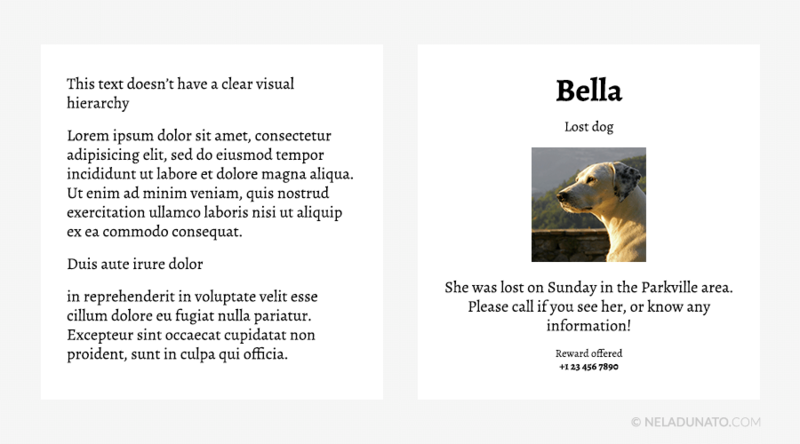 The second example is a bit tricky: visual hierarchy is present, but it’s wrong. The dog’s name is emphasized, when it isn’t the most important information on the poster. 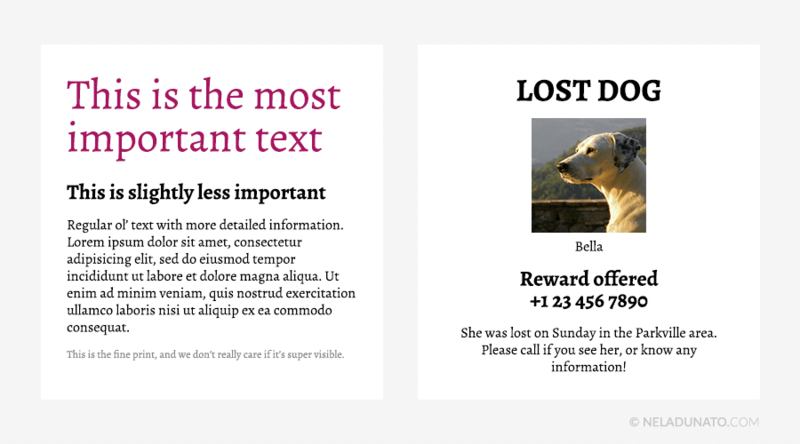 The most important information is “Lost dog”, because that’s what attracts attention and explains what the poster is about. The dog’s name doesn’t explain anything. What’s the single piece of information that would attract the attention of the person this design is intended for? For an event, it can be the title of the event, or the names of people that will be performing. Make this information large, in bold letters, and in a contrasting color. What’s the second most important information, after the person has expressed interest? For an event, that could be the date and the place. Make this information slightly smaller than the title, but larger than the rest of the text. 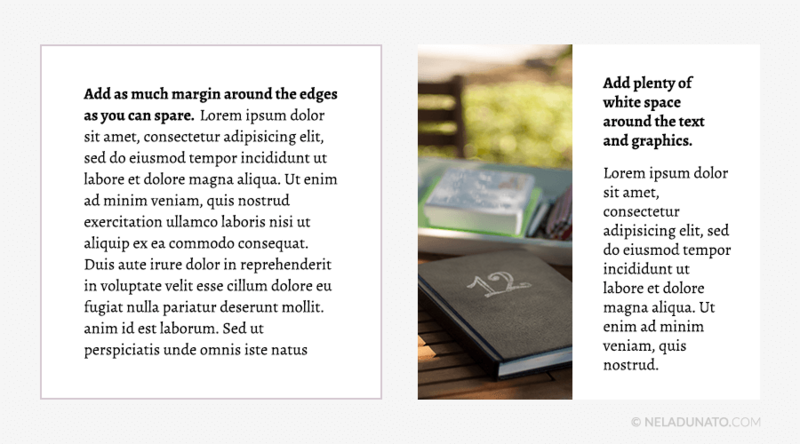 Depending on how many levels of information there are on your design, use smaller headings, until you reach the lowest level of information—body text. This information should be clear and readable, but in a neutral color and normal font weight. White space is the empty space that surrounds the information on your design (text or graphics). To make reading of the information easy on the eyes, there should be plenty of empty space around it. On a larger sheet of paper, the margins along the edges of the paper should be at least 2cm (0.75 in). On smaller sizes (like a business card), make them at least 0.7-1.0 cm (0.3-0.4 in). 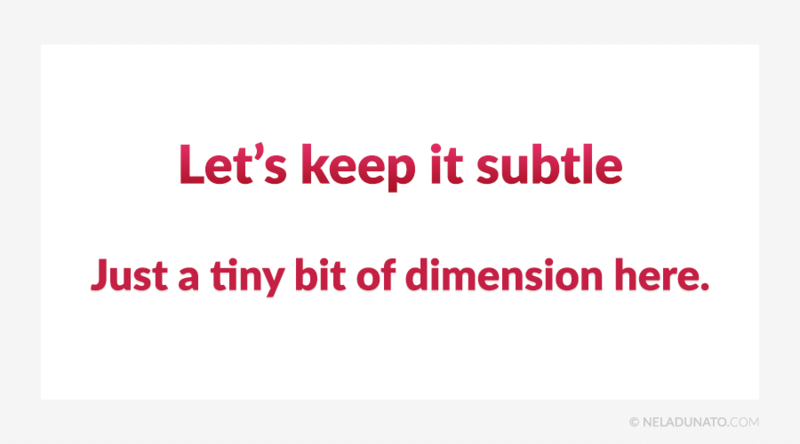 If you’re using shapes like rectangles, circles or polygons as backgrounds for blocks of text, leave a bit of room between the edges of the shape and the text. Add more space along the edges! That’s it. Move the text frame in your design app away from the top and the bottom of the canvas, and make sure the frame doesn’t touch the right side or the bottom. If you have room to spare, add more empty space than you think you need. White space makes designs look classy. Crammed designs look cheap and amateurish. I see this one popping up most often on price lists. 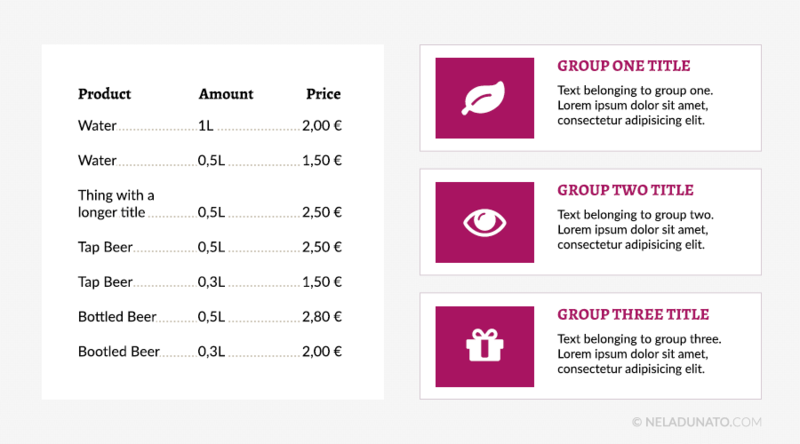 Price lists are complicated: there's the item, the amount and the price, and you have to make it clear which amount and price is related to which item. Often what I see is that items are not vertically aligned with the respective sizes and prices, so it’s difficult to guess how much things cost. Usually this happens because people who design the price lists don’t use the tools available in design programs that make this process easy. Instead, they try to align things by hand, which doesn’t work. Another example is when several services, features or products are presented and laid out on a page in a way that isn't clear which image is attached to which text description. It gets even more confusing when it's not clear which link or button leads to more information about the item. Use the built-in tools in design applications that help with aligning information visually, like tables or tabulators. Add more spacing between rows. 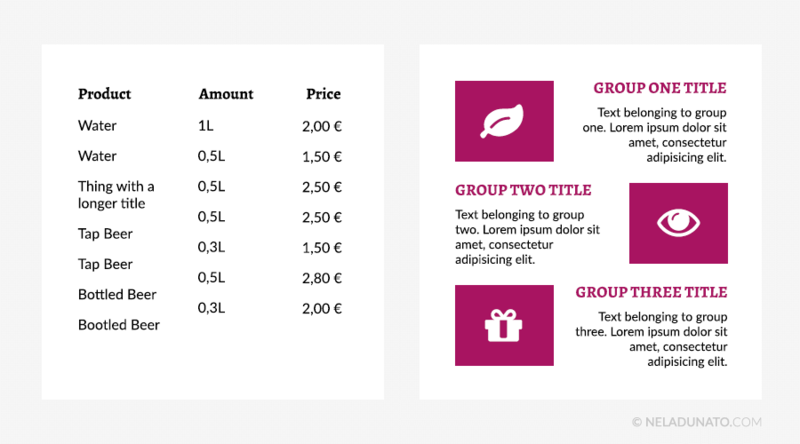 If it makes sense, use borders or rectangle shapes to visually separate different groups. When designing a more complex project that has plenty of text, sometimes people vary the text alignment from one section to the next. This makes the design as a whole look inconsistent and sloppy. One column is aligned left, another one is centered, and then the third one is left-aligned again. Or, the paragraph text on the website is aligned left, while the headings are centered. Variation in text alignment can make the text more difficult to scan and read (see point #5). People might skip over some sections because the next line wasn’t where they expected it to be. It just looks bad. Even people who are not designers notice that something is amiss (even if they’re not sure what it is). Keep alignment consistent across the section (for example, in all columns). 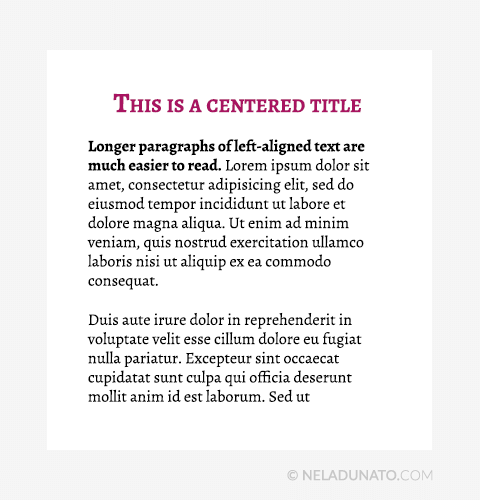 Whenever larger areas of text are involved, use left or justified* alignment. Reserve centered text for very short captions (see point #5). Avoid right aligned text—it’s the most difficult text alignment to read. * Justified text isn’t the best option for the web, though. Read about more web typography best practices here. Sometimes people take the above advice too literally, and decide to center every single piece of text on a website or a brochure. We like using centered text as the design looks symmetrical. Still, it’s not advisable to center large blocks of text, because centered text makes reading more difficult. When the eyes reach the end of one line, they jump to the beginning of the next line. With left-aligned text, the beginning of the line is always in the same place, so reading is easy. 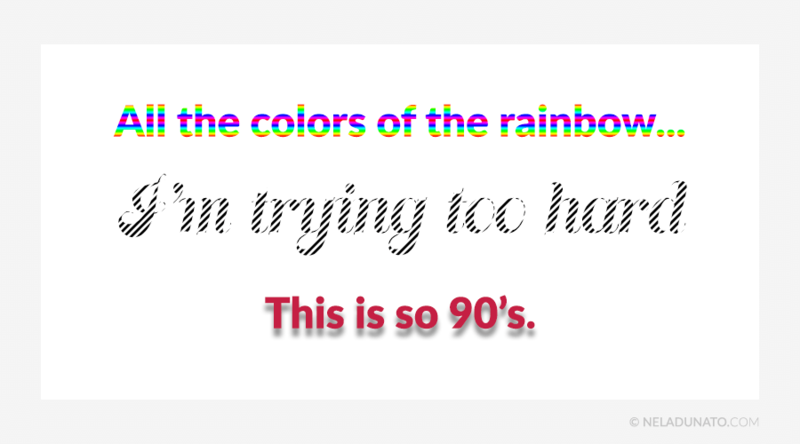 With centered text, the beginning of the line shifts from line to line, so it takes more time for the eyes to find the first word and continue reading. While this delay may take only a small fraction of a second, the impact adds up on long-form text such as blog posts, sales pages, brochures and documents. 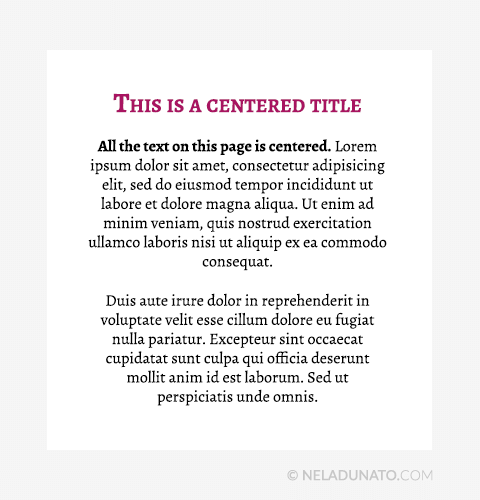 Reserve centered text for large headings and smaller blocks of information (posters, business cards, presentations, social media graphics etc.). 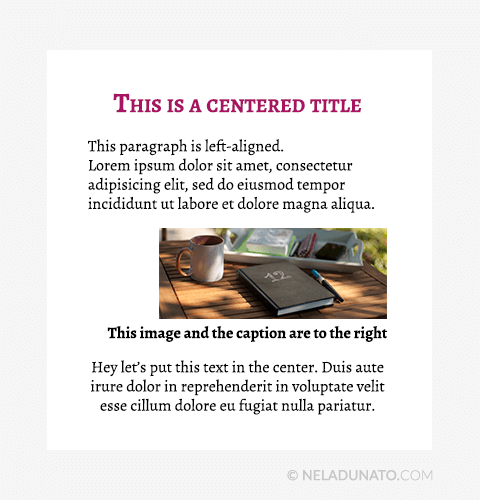 Do not use centered text alignment for longer paragraphs. Body text, body copy or paragraph text is a longer block of text consisting of sentences and lists. (The text you’re reading right now is body text.) The most important purpose of this text is to provide information in a clear, easy to read and legible way. Avoid any design treatment on the body text that would impair clarity, legibility and readability. 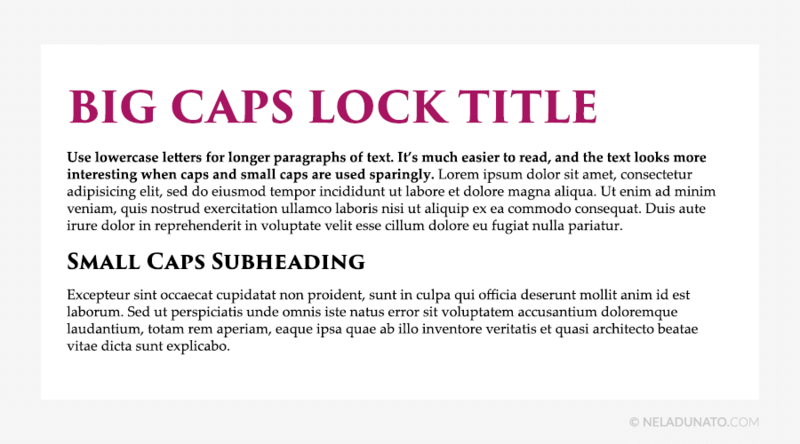 Use lowercase text in paragraphs, lists, quotes, and any text that runs longer than a single line (or two at most). 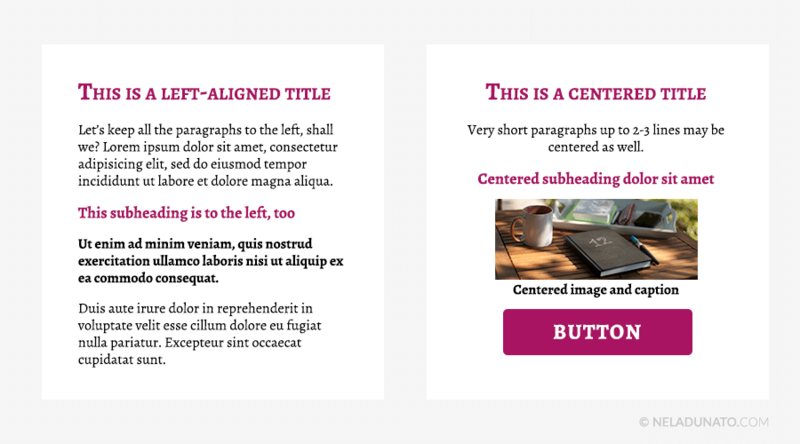 Use all caps or small caps sparingly, to highlight or differentiate smaller blocks of text (titles, headings, subheadings, website menu items, buttons, etc.). But what if the font you want to use only has an uppercase and a small caps option? There are certain fonts that don’t have lowercase letters (Trajan Pro is a very popular one). These fonts were not designed or intended for body copy—use a different font instead. 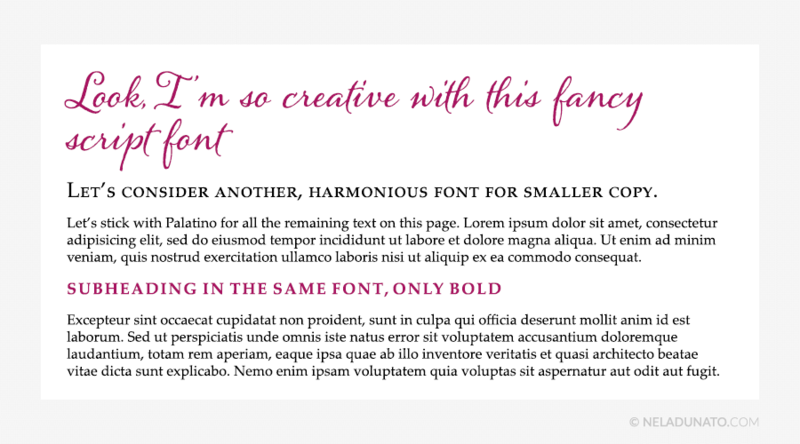 There are thousands of free fonts to choose from, there’s no need to stick with one that’s inappropriate. Even professional designers are guilty of this one. Many websites today have body text that’s impossible to read because it’s too light. Black text isn’t cool anymore, I suppose. 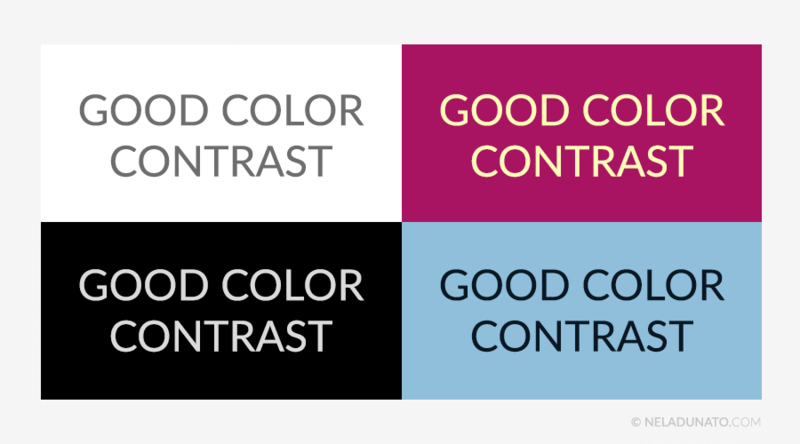 Poor color contrast impacts clarity and readability of the information. Be aware that not all people have as great eyesight as you, and may not have a computer display with a good contrast. If you can read the tiny gray letters well, this doesn’t mean that everyone can. Choose text and icon colors that are much darker or much lighter than the background. 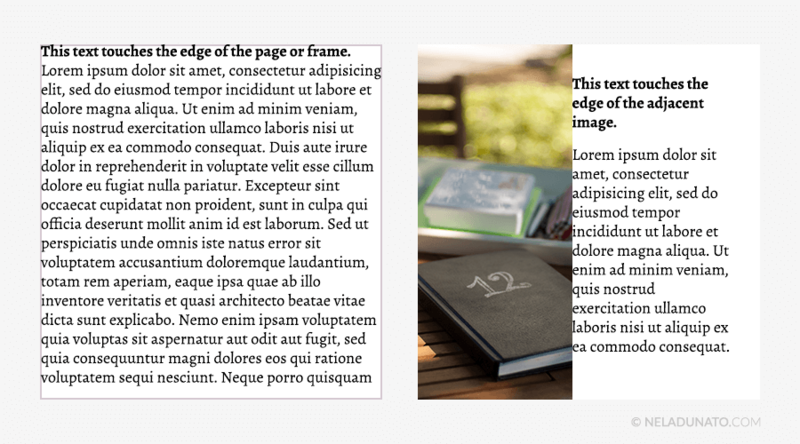 Test the design on different devices to see if there's a shift in color contrast that makes the text hard to read. 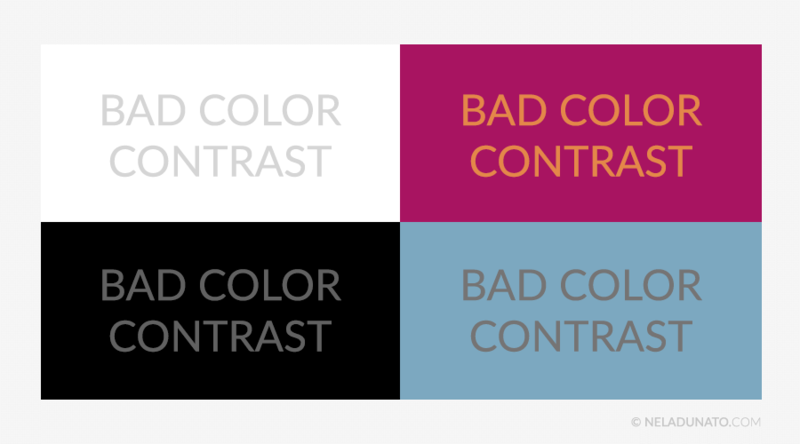 Use tools like Colour Contrast Checker or Contrast Ratio to ensure your color combinations comply with the Web Content Accessibility Guidelines. The problem with having so many different fonts at your disposal is that it’s hard to find the ones that are suitable for professional use. 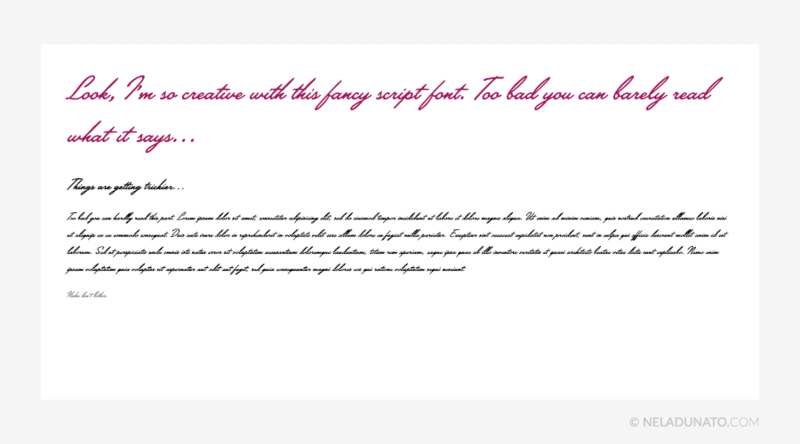 Script fonts are the biggest culprits here, and most often used in the arts, wellness and coaching industries. There are script fonts that work, and there are those that don’t. If you can’t easily tell certain letters apart, it’s not a good font to use. 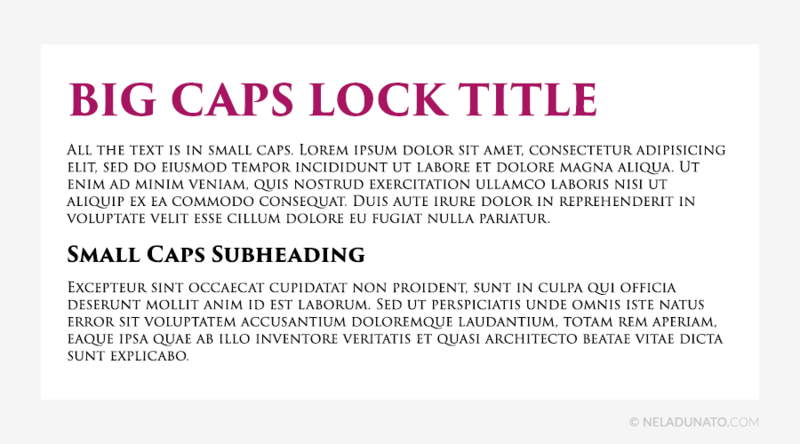 Funky fonts require a certain minimum size to be readable, which only makes them suitable for large headings. If others are stumbling through your text, the font is not good. Switch to another one that’s clearer and more easy to read. When newbie designers discover effects (such as drop shadow, stroked letters or gradients), they'll use them at every chance they get. Unfortunately, knowing how to use as many software features as possible does not make a good designer. Tacky text effects are the most obvious sign of an amateur designer. Stop relying on them to make your designs visually interesting, and use other tools at your disposal (color, photography, illustration, icons etc.). Forget that these features exist. Challenge yourself to refrain from using any effects, styles or filters for at least one month so you force yourself to think more creatively, instead of relying on crutches. Or, if you absolutely have to use effects, use them very sparingly, in a subtle manner. Having more than 2 font families in a single document leads to visual chaos. There are exceptions to this, but only experienced designers can pull it off and make it look classy. Pay attention to professional publications (newspaper, magazines, catalogs) by top brands, and you’ll notice there’s a consistency to how they use fonts. 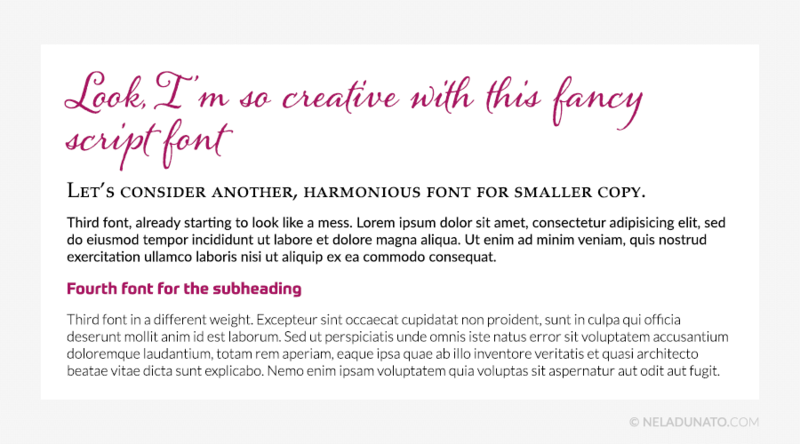 Vary the weights of the font family you’ve chosen for body text, headings, pull quotes, captions etc. 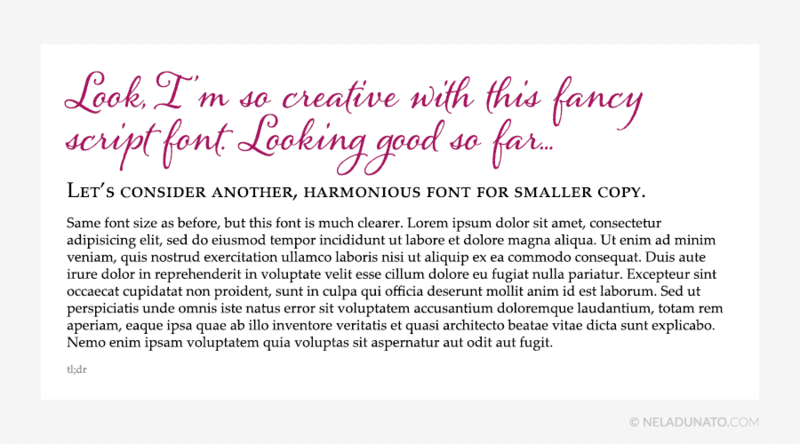 and you’ll be able to create visual interest even with just one font family. Unlike in the real world, digital color costs nothing, so it's tempting to include all the colors under the Sun in your design. Try not to do this. Colors are not only used to draw interest to your design, but also to organize information and drive the visual hierarchy (see point #1). If you use too many, you might be creating confusion instead of interest. I’m not saying that designs can’t be colorful—there’s a time and a place for it, sure. If you’re designing a kids birthday party invitation, feel free to go nuts. Cultural events can also benefit from a bit more color. However, if you’re targeting a mature professional audience, this might not be the best way to go. 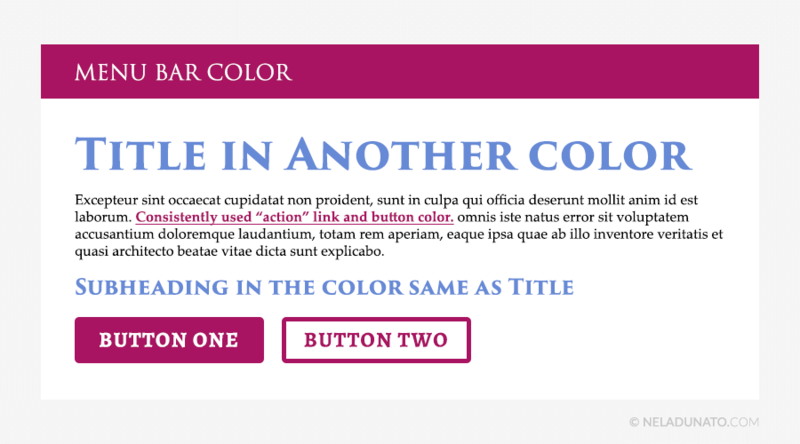 Pick a color you’ll use to emphasize information (headings, backgrounds, illustrations or icons). 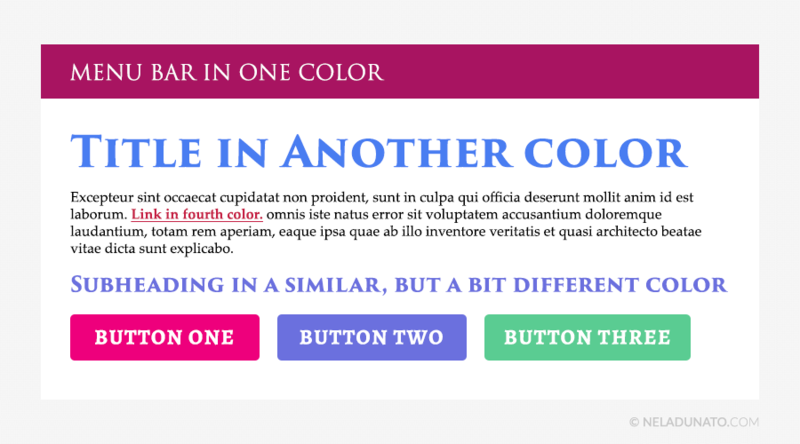 Then pick the color you’ll use for calls to action (buttons, banners, links, web addresses etc.) Use a neutral color like black, dark grey, dark blue or dark brown for body text. Stay consistent with your color palette with all the visual communication pieces you create for the same company. Use the Swatches or Palette function of your design program to save the colors you frequently use, so you don’t have to pick them out manually each time. 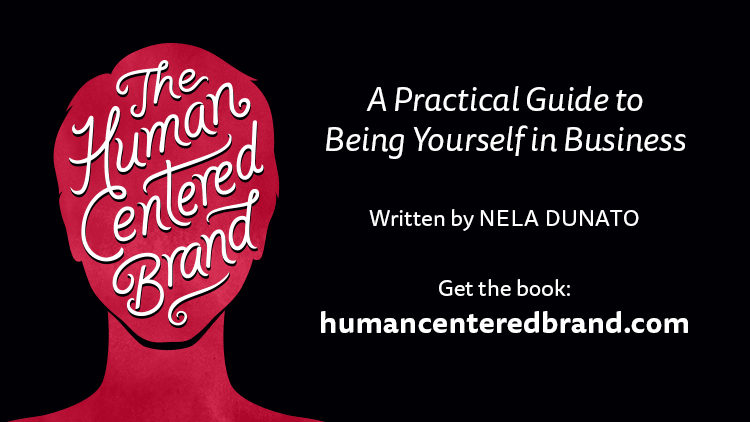 If you need help picking out the right colors for your brand, I have a great resource for this. My free class Revamp Your Brand In One Day leads you through the process of defining your brand strategy, creating a moodboard & choosing the perfect colors and fonts for your brand. 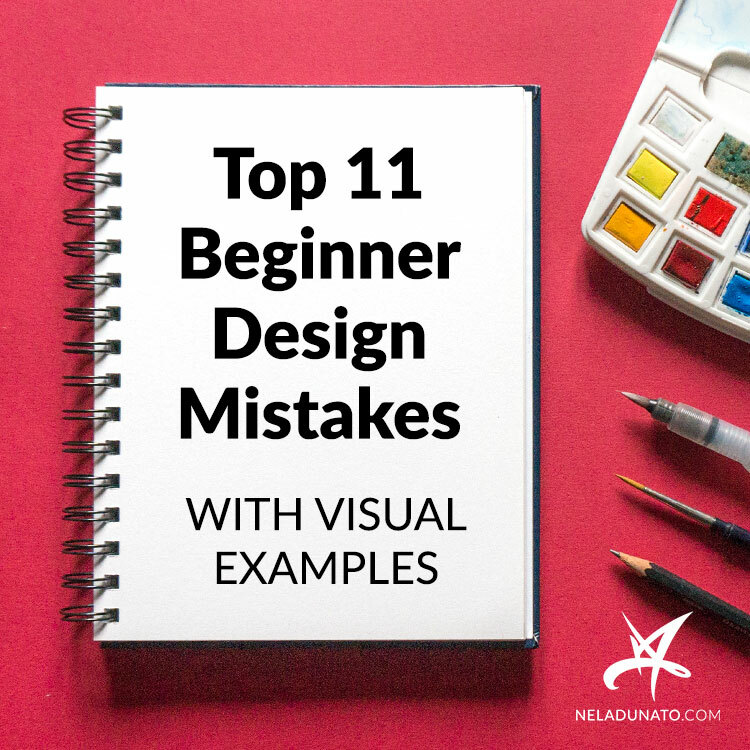 Are you making any of these 11 beginner design mistakes? A friend of mine suggested that I turn this post into an infographic, and I finally got around to doing that. Click on the image below to download the larger version (opens in a new window). You can use it as a checklist every time you're creating a new design. Feel free to share it! Fixing just the issues I’ve mentioned will tremendously raise the bar on your designs. Your next project proposal, presentation, Facebook ad or birthday invitation will look classier and more professional. From here on, you can move forward to some more challenging aspects, and work your way toward becoming a brand that delights its clients—not only with the value you provide through your products or services, but with every single piece of communication your share with them. I love this! Thanks for writing this post. I know what you mean – the "shoulds" and "have-tos" can really drain one's enthusiasm for learning. From my experience, websites are a constant work in progress. Making small adjustments here and there when you can spare a few minutes adds up to big changes over time. This is so helpful thank you Nela. Your examples are very clear & make a lot of sense. Thank you, Juliet! :) I'm glad you think so. Meanwhile, may I mention a pet peeve of mine in design? Websites and blogs that have most of the copy in reverse color (I don't know the technical name.) You know what I mean - whole stories written in white letters on a black background or similar. Especially when using a font with serifs - I can barely read it. Should a friend tell a friend that her color choices are causing eye strain? Thank you again for your clear descriptions and imagery. I appreciate your putting this guide together. It's very helpful. Oh, the website link is not required, but thank you for sharing your own despite your discomfort. Let me tell you a little secret: all business owners think their website needs work. This is never "done", because there's always something to tweak or add, and there's never enough time. I'm a professional and yet there's so much I still need to do with my own site, I'm just not able to get to it. I hear you on the dark backgrounds. This practice evokes some strong opinions. My old website used to have a black background with white letters all over, and after receiving a few complaints I thought it over. I personally don't have a problem with it, and some usability experts claim it actually helps with eye strain, but perhaps in this case the contrast is just too big. I think it's fine to share your experience with a friend. If the website causes strain, that's no good. They may listen to it or disregard it, but at least if they decide to re-design their website in the future, it will be something to keep in mind. I have a Croatian website too, and sadly not enough time in the day to translate everything I'd like to post there.